With the full version of VAM dB you have a new option for emailing quotes to a lead or client, using QuotesApply.com. 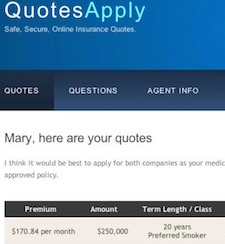 Instead of having the quotes listed in the body of the email you can now send a link to a secure website where they can view their quotes, submit questions or select a quote and send a request to apply. 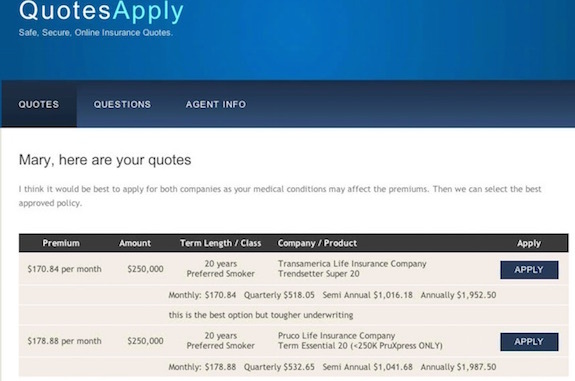 You can use this for any type of insurance quote you enter in VAM dB. You have the option to show all modal premiums or just the one you selected. You can enter a note to be used in the email, a separate one to be used above the quotes on the website and you can enter a note for each quote you save in VAM dB. In VAM dB you are alerted any time someone views their quotes online. You can see many times when an email is viewed, but with the quotes we know for sure when they view them and you are alerted. In the upper right of every page you will always see the activity and any new alerts for person's who submitted questions or selected a policies and requested to apply for it. This better lets you know who you should follow up with and who hasn't gotten or viewed their quotes. A better and more secure way to send quotes to your leads and prospects. Know which leads have viewed their quotes and when, have all information sent back into VAM dB and their record so all information is in one easy to find place.